In PR and communications, we’ve faced a familiar challenge for quite some time. Sometimes, we do the usual: send a few press releases, do some media outreach, pat ourselves on the back and do it again tomorrow. But for a long time, our industry has needed evolution. We do the same thing, and yield the same thing – yet wonder why we don’t earn more budget or praise. 1) ROI doesn’t always have to mean Return on Investment. In fact, it can mean Return on Ignorance. The risk of remaining stagnant might not be that daunting for some, but let’s put it into perspective: would you rather do the same old things and produce the same old results, or implement new things and be able to demonstrate new, exciting and meaningful results? It’s not always easy to break out of the mold and get approval to experiment and try new things or A/B test, but done right, these learning experiences can garner valuable takeaways for brands and inform future strategy. 2) More mindfulness, less strategy. This tenet may seem counterintuitive, as strategy is a term thrown around a staggering amount of times daily by brands, but at its core, it’s about keeping the audience and end-user in mind first, rather than the other way around. 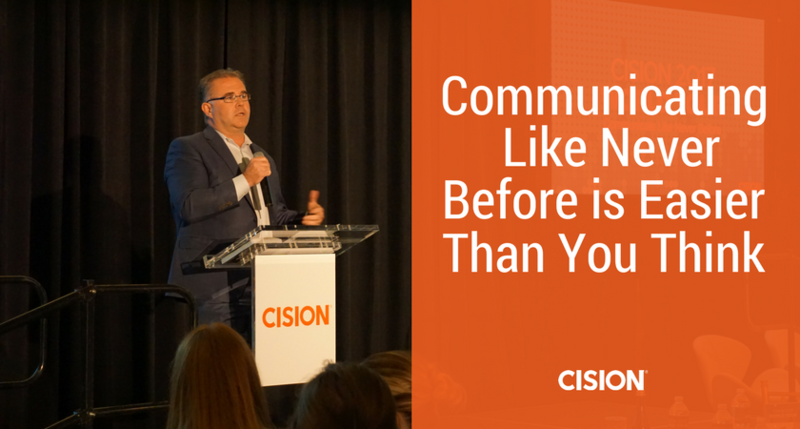 Cision CMO Chris Lynch echoes a similar sentiment – consumers should dictate influencer and outreach strategies, so that we’re communicating the right message at the right time to the right audiences. 3) Success lies in how we use technology to see around the corner and fundamentally change. Adopting new technologies is essential to brand evolution, but it’s not always about chasing the shiny object and spreading yourself thin across tools or platforms. Having the foresight to evaluate the implications of technology and the big picture, long-term effects can help advise you on where to where to spend your time and money to ensure you’re getting the most out of new tech. 4) Brands shouldn’t leave experiences to chance – experiences should be designed. Just because User Experience (UX) isn’t necessarily the “duty” of the communications team doesn’t mean that PR can’t contribute. So how can we be a part of it? There are many ways: provide great customer experience on social media no matter whether a customer is having a great experience or not, engineer an influencer experience that immerses key audiences into your brand via an activation or content, or utilize data to refine strategy across your team. Like #2, keeping the consumer at the forefront of your planning does more benefit to your brand than harm. 5) Be truthful. Be engaging. Be proactive. Be human. During our “Creating a win-win relationship with the media” panel, a recurring theme from brand leaders from Adobe, Kimpton Hotels and Evite were these simple rules. Transparency, focusing on more than just engaging and being more than just an auto response can foster an emotional connection with a brand that has been proven to be a significant amplifier when someone considers a purchase. Can comms drive this? Absolutely. In essence, what’s old is new again in the communications industry, and the basic principles we were taught still remain: public relations is about people and relationships, and without this foundation, many comms practitioners fail. Once this philosophy is part of the equation in everything that we do, we can then layer on the tools and technology to knock it out of the park. As a fellow PR pro, this is my challenge to you – are you up to it? Want more World Tour? Sign up to attend in a city near you or check out our recaps of our other cities plus exclusive Facebook Live coverage!